So excited for you, Elaine! 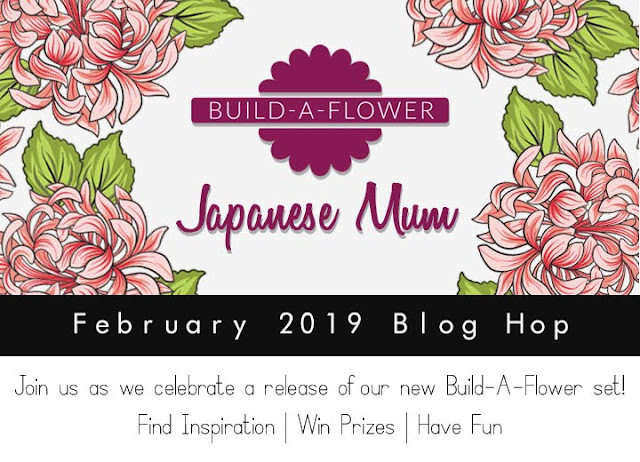 To claim your prize please email winner@altenew.com by 2/15/2019 with the subject line BAF: JapaneseMum Release Blog Hop Winner from Patricia's Blog. Enjoy!!! I read all of the comments and they all made me smile, thank you so much!! 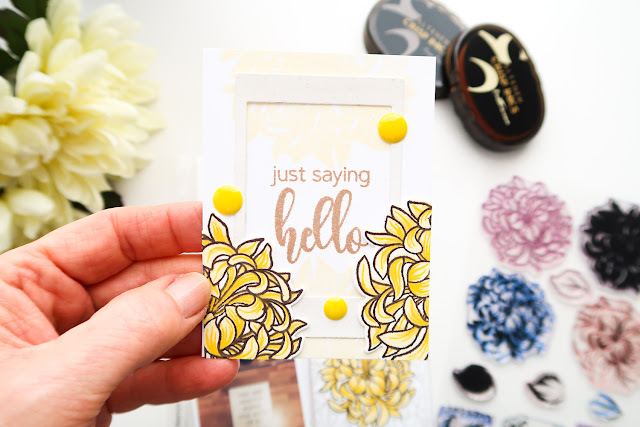 Welcome to the Altenew blog hop to celebrate their new build-a-flower set! You should have arrived here from the lovely, Rubeena Ianigro's blog. I intended to create one project with the new Japanese Mum and matching die, but every time I would clean up, I would be more inspired to create another project! This first project is a Travelers Notebook insert. I've cut down two pieces of Altenew Moonrock cardstock to 4 1/2" x 8 3/4", the size of a TN or Travelers Notebook. Inspired by the sentiment, You Make Me a Better Person, I picked a photo to go with it, then started adding texture to my pages. 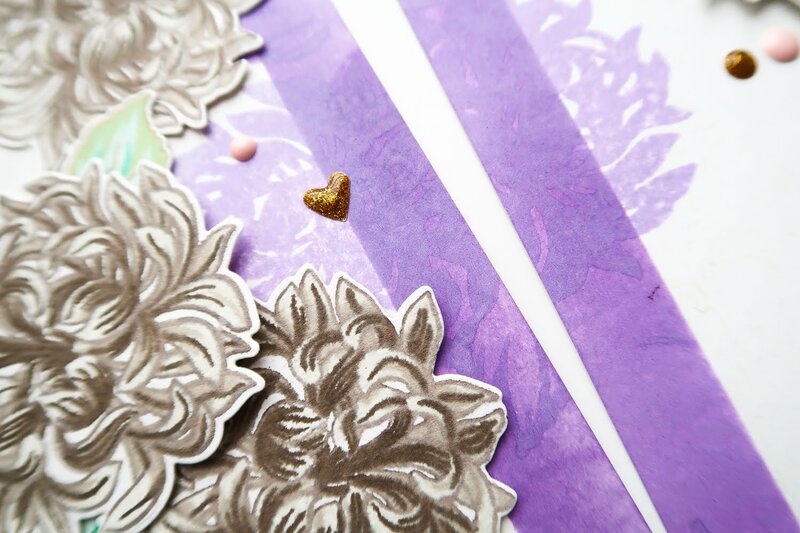 I used the leftover pieces of trimmed Moonrock cardstock to use as a mask to create an inked border along the inside edges of the TN spreads using Lavender Fields and Deep Iris. Then stamped just one layer of the stamp and leaves along that border, coming into my TN pages using Deep Iris. The overlay look it gave after the ink dried, made it looked raised. Then I decided on neutral flowers using Moonrock, Evening Gray, Morning Frost, and Lava Rock, and for the leaves Rocky Shore, Mountain Mist, Frayed Leaf, and Volcano Lake. 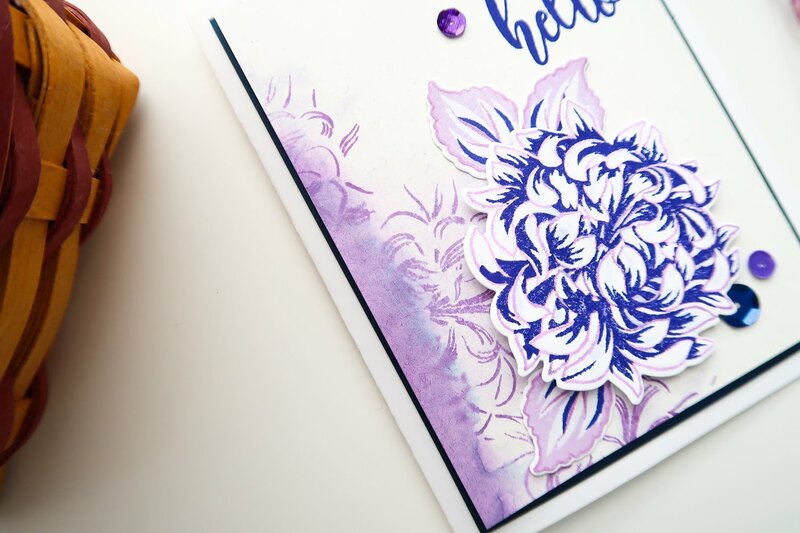 I am amazed by the different looks you can create with these four layers of stamps and different ink combinations. While cleaning my desk, I typically don't like to waste leftover scraps, so I was inspired to use the trimmed Moonrock cardstock I used as a mask on my TN as a card panel. Going with that imperfect, art-like look, I inked the full image of the flower, sprayed it with water (generously), then pressed along the edge of my inked border. A very messy, impression of color is what it creates. That messy impression, gave me a place to then add another layer of the flower stamp in Lavender Fields ink. For my focal point flower, I did not use all of the layers, adding a wet brush to the outlines stamped image, and the darker Sapphire ink to some of the petals before stamping only a second layer of the image in Sapphire to create a bold contrast. For the leaves, I used Deep Iris, Soft Lilac, Lavender Fields, and Sapphire, using all of the leaf stamp images. For another bold contrast, I used a smaller card panel in Navy Cardstock. When I first started playing with the stamps, I picked yellows to work with. I thought these stamps and my leftovers would make great cards for pocket page scrapbooking. 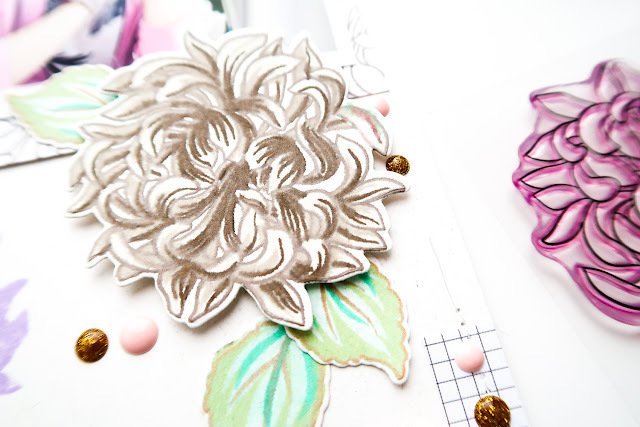 Using this sentiment as the focal point on this card and project, I added the solid image of the flower to the top and bottom, and cut apart a stamped and die cut flower to add to the sides. Inspired by my TN photo mat I created with the stamps, I used that same idea here as a card, with just simply layering a completed stamped flower on top. I used the Altenew Calligraphy Alphas stamp set for my year on this card, and used some of those leaves to create motion. Then I picked out a photo that went with the colors and theme to put inside my 6x8 pocket page. The ink colors I used for this spread are Moon Rock, Buttercream, Mango Smoothie, Warm Sunshine, and Jet Black. Beautiful set, YES! So much detail and texture and so many ways to use. I have a video here of my TN and card process or you can view from my YouTube channel here. Now onto the fun part, PRIZES and fun details! Altenew is giving away a $30 gift certificate to 6 lucky winners! Please leave a comment on the Altenew Card Blog and/or Altenew Scrapbook Blog for a chance to win. Three winners will be announced on the Card Blog, and other three winners will be announced on the Scrapbook Blog on 2/9/2019. As a thank you for taking the time to visit my blog and comment, I will pick one lucky winner to receive a $20 gift certificate. I will announce the winner on this updated blog post on 2/6/2019. I am so honored to be a part of this hop, thank you for stopping by! The hop is filled with so many talented ladies, including this lovely next stop to Laura Jane's blog. Good luck!! These are awesome projects! :) Thanks for sharing. I’m quite inspired by your pocket page! So pretty. Love all your projects! They are so pretty! This is such a beautiful set! These are such creative cards and layouts! Love your choices of colors and am enjoying seeing your wonderful work! wow love your creations - the flowers look so 3D!!! I love your work! I love that your cat's tail was in one of you photos too!! You really show the many ways that this set can be used. It's beautiful with just one layer! I love it!! more of your creativity. Thank you for sharing. Great projects! This is a very pretty flower. Beautiful! Great creativity with this awesome set. Fabulous projects - I especially love the neutral repeated mums background, with vibrant focal - fabulous look. Terrific way to see so much variety in the ways to use this set. Loved your page and seeing how you got there. Would've loved the yellow mums with the purple background as much as I did what you eventually decided. And I have that grays set and never could figure out how to really use them together. Well they are certainly spectacular on your flowers! Beautiful layouts. I loved the first layout soooo much....fun photo of you....great job!!! I so love this new stamp set....just so much fun to see what everyone is doing with it....fun blog hop!!! Beautiful creations! Love how you used the new set! So many fabulous projects!! They're beautiful and creative! Thanks for sharing these beautiful projects. I am impressed with your mums. So pretty! The tail of your cat could be a photo of my cat, Mischief. She is a tortoise shell cat as yours is and the colors in the tails match almost perfectly. Thank you for the tutorial. It makes learning so much easier. I am so loving this stamp set!!! Awesome projects. 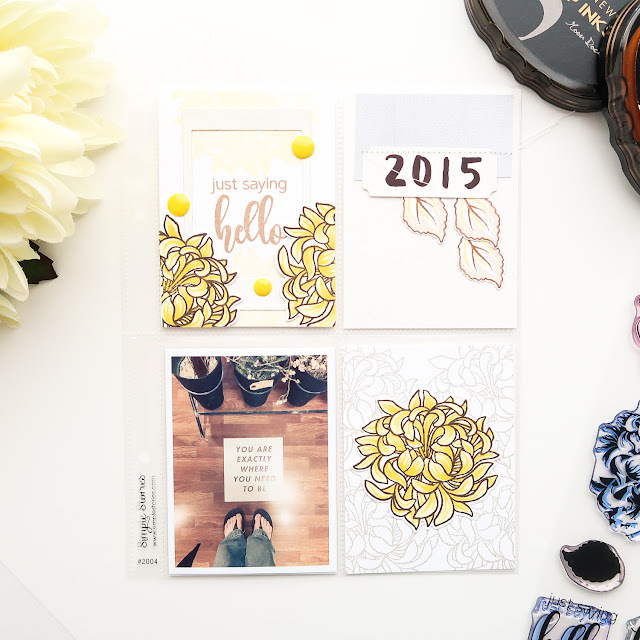 This stamp set is so beautiful and so versatile. Elaine, my random number was 30 and you are the 30th comment and winner! See the post for details on how to claim your prize. Congratulations!!! 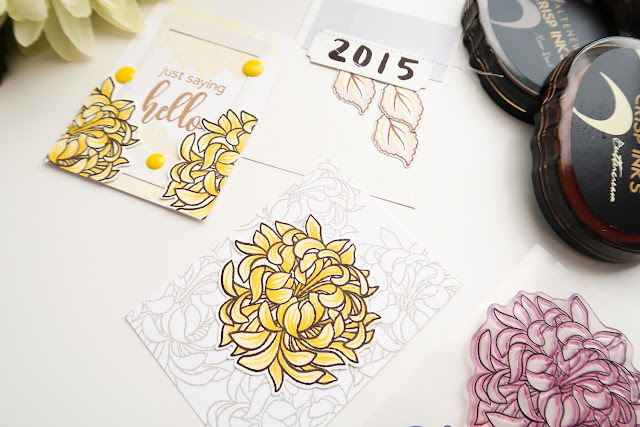 The Build-A-Flower stamp set is really versatile. Thanks for the many ideas in this post. What creative ways to use stamps. I love these ideas. 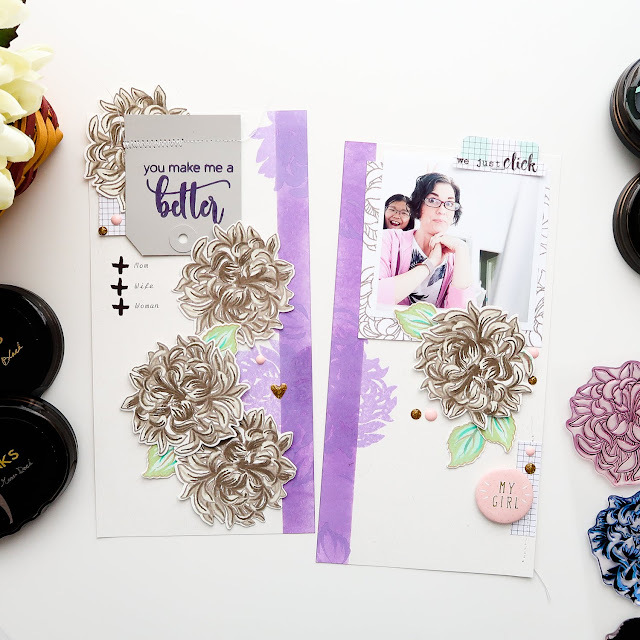 What a beautiful layout for your TN and also, the card was amazing in that you just picked up your scrap and went with it! Fabulous! Great video. Nice to meet you & I’m headed to your blog now! Never heard or saw a T N before, great size. What a fabulous fun layout you got. Beautiful cards as well, definitely looks like you had a good time. Thank you for the inspiration today. What a great Travel notebook. Love the layout and the cards too. Thanks for sharing. These are so fun! Love them. I really like the brown and purple on your travel notebook, and the way you altered the sentiment for your page. Your card is beautiful. And great way to use up scraps, making some cool pocket cards. Very resourceful! Thanks for the wonderful video! I love your pocke page scrapbooking with the new stamps, and using yellow hues, it’s so fantastic! Such nice projects; your creativity is boundless! Lovely projects with this gorgeous new BAF set! Love this gorgeous BAF set! Your Projects are fabulous, thanks for showing the versatility of this set! I loved your stunning layout. The sentiments were great and the flower images divine! Your card was lovely too. Thanks for the inspiration. Wow!!! 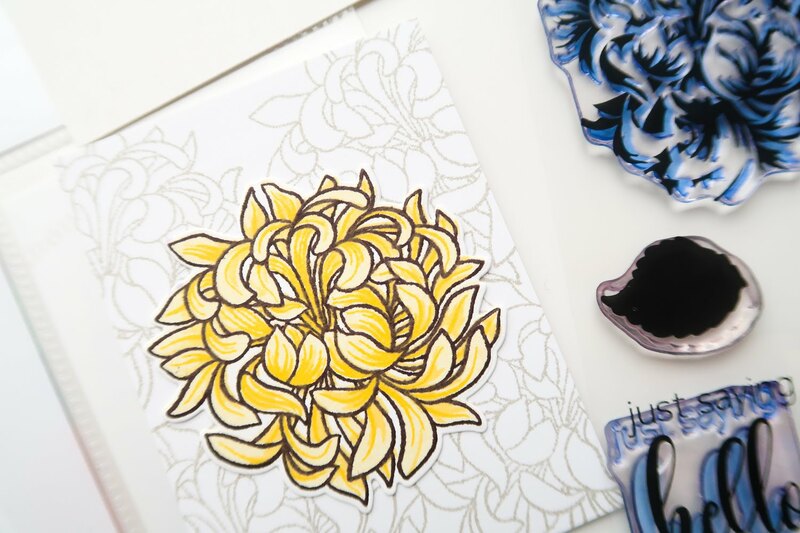 So many amazing uses for this amazing new flower set, Patricia! Your work is stunning! Thanks so much for sharing as well as the great inspiration! All I can say is, "WOW!!!" This is incredible. 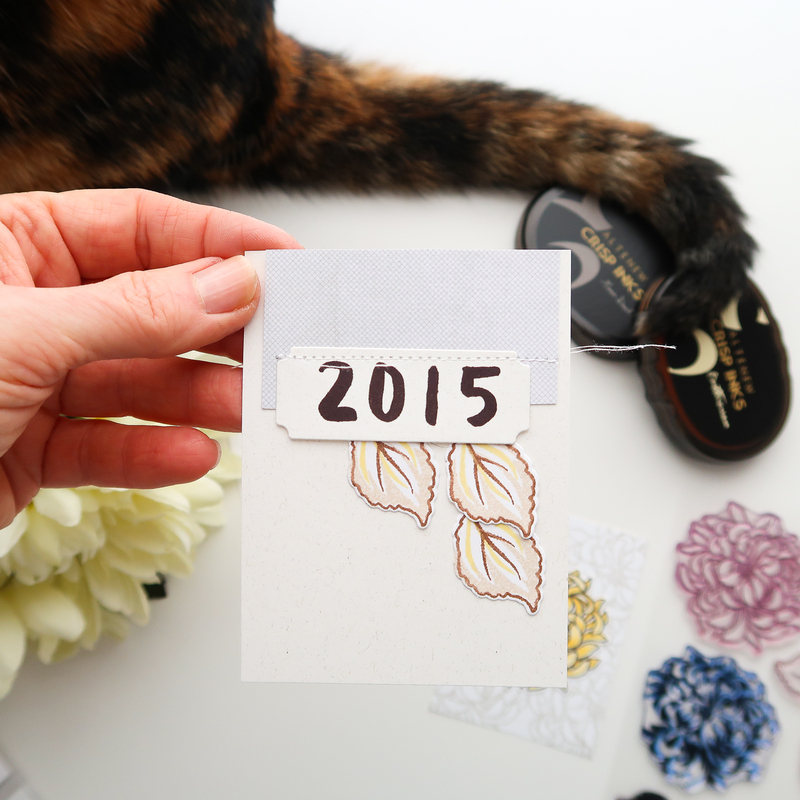 Your TN page is awesome, and I love how you used your scraps to make the card.... 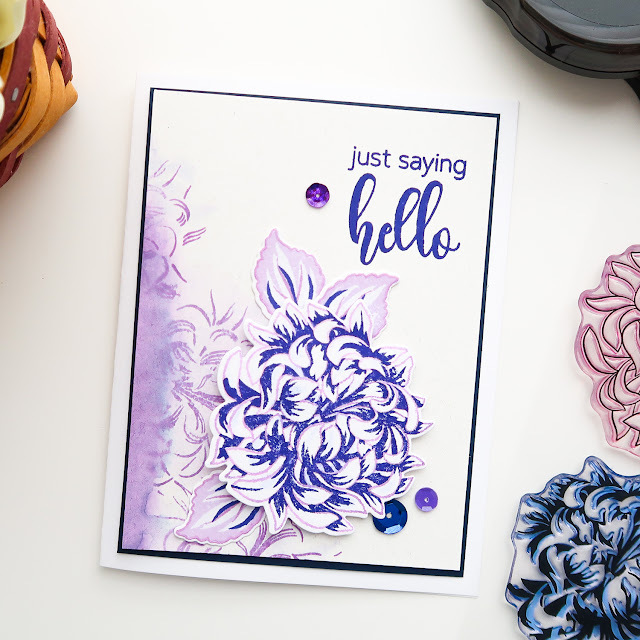 The impressionistic floral look is wonderful, as are the cards or the pocket page scrapbook. Awesome job! I really loved your monochromatic take on this month's BAF. The grey and white one was especially pretty. Thank you for sharing your techniques with us! Such a nice variety using the mum. Love them. Love your scrapbook page and card. Beautiful! Love your layout and all the details. Thanks for sharing! Love the neutral colored flowers and all the rest! Wow! I love all of your projects! I am sure I'm going to be the same way when I get this set, I'm going to want to stamp it in many different colors too! I love that you did the first ones in neutral colors, I never would have thought of that but it's beautiful! Thanks for all the inspiration! These are gorgeous! I especially love that tan mum. I would not have thought to use a neutral color like that but I love it. I have to give that a try. Patricia, they are gorgeous flowers on your pages. Totally love it! Always fun to see scrapbook pages! I love all of your different projects with all of the different color blossoms. So creative!! I loved your Kitty's tail in the one photo, so adorable. Mine lays underneath my diecutting table and sleeps. I got him a cozy bed for Christmas but he's not having it. He prefers to lie on one of my old t-shirts. Everything looks stunning! I really love the color combo of the flowers on your TN. That purple and sapphire one looks gorgeous too. Thanks for the video! I really enjoyed it. Darling layout and sentiment! Love the purple! Your cards are stunning too! What interesting colors you chose! The Altenew inks are so well grouped into collections, that I sometimes forget that I'm allowed to go outside the ink packs! I think the brown outline around the leaves is a particularly nice touch to help them tie in with the warm grays. Thanks for sharing with us! These are beautiful! Love the flower cut in half! So many cute projects! I love the mini "just saying hello" card! What a beautiful sentiment and framed with equally beautiful flowers. What a wonderful set of projects! The purple card is my favorite, I just love the colors and the combination of a clean and messy look at the same time. I took away a lot of ideas from your other projects as well. Thanks for the inspiration! Very beautiful card. Love all of your different techniques. All your projects are gorgeous. This Japanese Mum set is so beautiful and the colors are wonderful. All your projects are gorgeous. This Japanese Mum stamp set is a winner. Wow, what gorgeous and creative projects. Stunning work! Your projects show just how versatile these gorgeous flowers are. Love them all, especially your color choices! 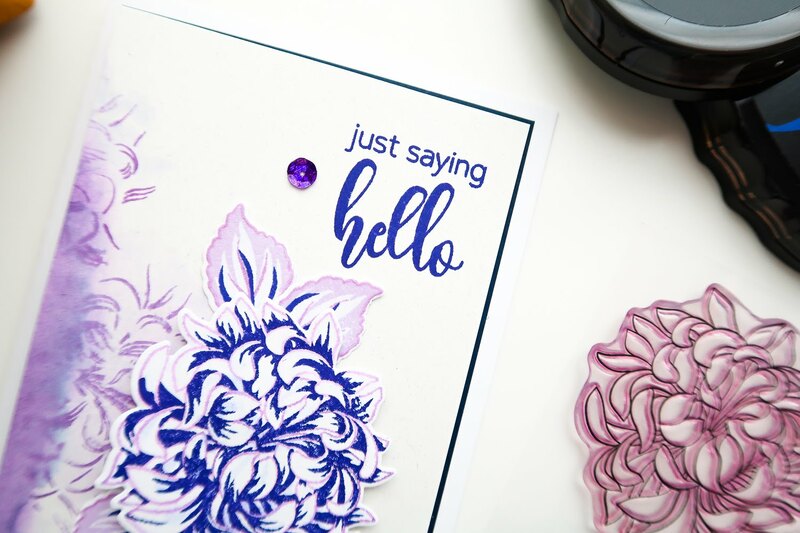 I love the pun on your layout and the beautiful cards you've created with this stamp set! Really lovely from start to finish!!! Thanks so much for sharing! So many pretty images in your post, but what I want to remember most is how you cut the mum in 1/2 & used it to frame the sentiment! Amazing projects. My favorite is the purple card. I love how you used all the various purples. Even purple leaves! Say hi to your cat for me. What's her name? Thank you for sharing your many projects with us Patricia! I am new to card making and seeing the versatility of these products is really inspiring. I have to say I like the mum in yellow best so far. Makes me excited for spring weather! Yay! You can make card making as simple or detailed as you want, so just start creating. And yes, I agree...makes me ready for spring weather!